"Century 28: Gods and Monsters"
Metron is finally able to get the sanctuary the New Gods have been living in from the dimension they had been trapped in to their own universe. He momentarily wonders if the New Gods had survived and gets his answer when Highfather, Lightray, Big Barda and Beautiful Dreamer greet him. Both Barda and Dreamer feel that since Metron had the homing device since before New Genesis was banished from normal space they should have been back sooner. Highfather tells them that Metron has never done anything that is not finely calculated, but Lightray is quick to point out that Metron has never been concerned with anything but his own agenda. Before Metron can argue further Scott Free arrives fresh from being revived from his hyper baric chamber after eight hundred years. Barda wonders why her husband left the chamber since he now ages after giving up his godhood. Free asks Highfather how many they lost and Highfather replies that more than half the population was lost after being separated for so long form the unique energies of the source. Scott comments that only the strong survived, which leaves him surprised that Dreamer had survived. Dreamer tells him that the strength of godhood is sometimes more than physical. Highfather finishes Barda's comment that the gods who survived are greatly weakened except for the son and daughter of Superman and Beautiful Dreamer; Lar-El and Vara. Highfather is grateful for this since he believes the forces of Apokolips may still attack. Lar is doubtful but the sudden arrival of Darkseid proves him wrong. In Gotham City Bruce Wayne and Lara pay their respects at the grave side of their son Thomas. Superman arrives to pay his respects and the group discusses how proud they were of Thomas. Suddenly a Boom Tube rips open and the dying form of Metron flies out. He reveals that he managed to home in on Superman and in his final moments he hands Superman a device that has just enough energy for one last Stargate with passage for one each way. He charges Superman with the task of saving New Genesis and then dies. Superman tells the others to stay back and they watch the magnificent display of Metron becoming one with the Source. Superman changes out of his suit and into his Superman uniform. Bruce asks to go with him, but Superman says no since the Stargate has only enough energy for him to get there and get back. Before leaving he tells Bruce and Lara that he will find a way to get a message to them about how New Genesis is doing, but he fears that after two hundred years the news won't be good. When he exits the Stargate Superman finds the remains of New Genesis. Lar-El comes out of nowhere and attacks. Superman recognizes him and his sister when she arrives. His progeny are less than thrilled to see him, but Vara believes that he can be of use in the fight against Darkseid. Superman is surprised that Darkseid is alive and is led to Highfather. He is then lead to the Beautiful Dreamer, who wants to know if Superman tried to find a way back to them. Superman admits that he tried but failed. Highfather wonders why it took Metron so long for him to use the homing device Superman had given him nearly a thousand years before. Superman himself is confused, mentioning that Metron made the comment that Darkseid sowed the seeds of his own destruction by attempting to guarantee victory. When Superman was in the 19th Century Metron explained to him that he would stay in suspended animation and will exist only as a temporal probability until the wave front collapses when he catches up to his own epoch. Superman was confused then and before he can talk about it further Barda arrives to give her report but she is distracted by Superman's presence. After a joyful greeting she informs him how half their number was now gone, among them her husband Scott Free. Suddenly the Parademons arrive and Superman leads the attack on them telling the group that while they are powerful they are also mindless and savage but not unkillable. Back on Earth Superman appears suddenly and tells Lara and Bruce about the battle. One by one the New Gods fell until Superman, Vara, and Lar-El are left. Darkseid arrives with Beautiful Dreamer in his clutches and kills Lar when he moves to defend his mother. Vara tries the same and meets the same end. Darkseid turns his attention to Superman and informs the Man of Steel that he will kill Dreamer next. As Superman dodges Darkseid's Omega Beams Darkseid breaks Dreamer's neck, but leaves Superman alive. Lara is confused about why Darkseid didn't kill Superman. Superman replies that Darkseid wanted him to suffer, much like Lex Luthor had when he killed Superman's first family. Superman informs them that Darkseid made a mistake leaving him alive and while he had spent almost a thousand years fighting a never-ending battle against the likes of Luthor and Darkseid, but always as a soldier or policeman because it was the right thing to do. Superman finishes by telling Bruce and Lara that Darkseid has made it personal. Story - 4: Overall I liked this issue. It did well to propel the story forward and I have to say that there was some good drama with the death of the New Gods and Superman's wife and children. Even Metron died and I didn't think that was possible. As much as I enjoyed the story there were certain aspects that bothered me; the first being how easily characters are killed off. Yeah, it's probably makes sense in terms of the overall story, but it is hard to feel sorry for characters who die when we have seen very little of them. While the death of the New Gods provided the necessary blood lust for Superman to get his mad on at the end of the issue it also did nothing on an emotional level. This has become a bad habit throughout the series. I realize that with the way the story is structured it is hard to get too involved with characters, but the New Gods have been there for some time and to have them return and die in the same issue didn't sit well with me. Superman's bloodlust was unsettling as well. Not in the way that I don't think Superman shouldn't get "kill 'em all, let Rao sort it out" mad, but the fact that he left his family to return to the Earth and was gone for two hundred years doesn't give him the right to be that angry. When Lois and his children were killed he had not left the Earth only to return at the moment of their deaths. That was a dramatic death and his wrath was warranted. Of course my feelings on this subject could be colored by the fact that I haven't seem the stories that led up to his relationship with Dreamer and the birth of his children, so it could be a matter of pacing rather than Superman being a cold hearted monster. In the end I enjoyed the issue, but not on an emotional level. There were too many deaths and not enough heart to it. Of course I still believe that when the story ends the whole thing will never have happened in one of those comic book/time travel paradox moves, but that's just me. Art - 4: Byrne did a really good job this time out with some nice page composition. His page layouts were varied and interesting and some panels stood out, particularly his version of Darkseid, which I always felt was one of the better characters he has drawn. He makes Darkseid seem massive and malevolent and outside of Kirby himself is probably the best version of the character ever. There were some classic Superman shots as well.�The first panel on page eleven was pretty much iconic with the shirt being ripped open, a shot I always like to see ever since seeing the first two Superman films when I was younger.�There was even a scary Superman on the last page.�I liked the shadow on Superman's face, which mirrored the darkness in his soul. The scenes of destruction and carnage were eye-pleasing as well.�The death of New Genesis and the scenes of war were a lot of fun.�The computer coloring continues to provide some interesting visuals, particularly the first and tenth page. All in all a good issue art wise.�Some of the sketchiness that permeates Byrne's current work is still kind of irritating, but over the art enhanced the story as good art should. 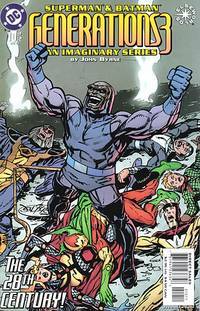 Cover Art - 5: This was a pretty solid cover.�The composition was even and the shot of Darkseid triumphant made for some very eye-pleasing art.�I have to say that it was definitely a nine out of ten on the Grab Me Scale and Byrne's affection for the Fourth World figures showed even though most of them were probably dead on the cover.